In today's Hit and Run, Jay Jaffe talks Brewers prospect David Denson coming out as openly gay, Madison Bumgarner's great day on the mound and at the plate and Matt Shoemaker's demotion. Another chapter of baseball history was written over the weekend when Brewers farmhand David Denson publicly revealed that he is gay, making him the first active player in the affiliated minor leagues to do so. Whether or not he ever reaches the majors, his announcement is a positive step forward, one that offers encouragement for future players at any level to do so and illustrating that teams and MLB are laying the groundwork for the eventuality of an openly gay player at the highest level. Denson had concealed the fact he is gay since being taken by the Brewers in the 15th round of the 2013 draft out of South Hills High School in West Covina, Calif. But the secret began to weigh more heavily on him, to the point he felt on the verge of a mental breakdown—or worse—at the outset of spring training this year. The 20-year-old Denson is a 6'3", 254-pound outfielder/first baseman for the Brewers' Rookie-level Helena affiliate. After 46 games in the Arizona complex league in 2013–14, he finished last year and began this one with the team's Class A affiliate, the Wisconsin Timber Rattlers, but struggled in 24 games before being demoted. His .244/.343/.385 line with four homers in 181 PA at Helena won't turn many heads, but he's not far removed from a .267/.356/.448 stretch in his first 33 games with the team. That helped him get selected for the Pioneer League All-Star Game, where he homered and won MVP honors. After Denson continued to struggle with the Timber Rattlers, the Brewers sent him to Helena to regroup, and he realized the necessity of coming out to his teammates, who have expressed their support. Via Sunday’s announcement, several current Brewers—including Ryan Braun, Scooter Gennett and manager Craig Counsell—said that he would be welcome in their clubhouse. In an ESPN poll last spring, 81% of players said that MLB is ready for an openly gay player, though the sport has not had one yet. MLS’s Robbie Rogers, the NBA’s Jason Collins, and Michael Sam, who was drafted by the NFL’s Rams but cut before last season, have come out publicly. While Rogers and Collins were able to continue with their careers, Sam played in just one game in the CFL before announcing that he was stepping away out of concern for his mental health. Organized baseball has not had such a pioneer yet, but via Bean, MLB has shown that it is heavily invested in supporting any player who steps forward in such a context. Bean, who concealed his own sexuality as a major league outfielder for parts of six seasons from 1987 to '95 before coming out publicly in '99, was appointed to the newly-created post by commissioner Bud Selig in July 2014. His job entails providing guidance, education and training in support of those in the lesbian, gay, bisexual and transgender community throughout MLB, including off-field employees as well as players. Denson is a long way from reaching the majors, though his prodigious power—he hit a 515-foot home run in a pre-draft showcase at Marlins Park in 2013—gives him a chance. Whether or not he makes it, his announcement and the support he has received should make it easier for other players wishing to come forward to do so, just as Conroy did in June. As Bean said, "The beauty of what could come from this is he can be an example that can help change that perception and change the stereotype that there would never be a gay person on a men's professional sports team." Have a day, Madison Bumgarner. On Sunday, the Giants' 25-year-old ace spun a 14-strikeout, three-hit shutout to complete a three-game sweep of the Nationals and added insult to the injury of Washington's playoff hopes with an RBI double off Joe Ross and a solo homer off Casey Janssen, his fourth of the year and 10th of his career. player date opp ip h bb k g sc. All of those nine games were shutouts, and while all of the NL pitchers except Cueto collected hits in their games, none of them did so for extra bases. 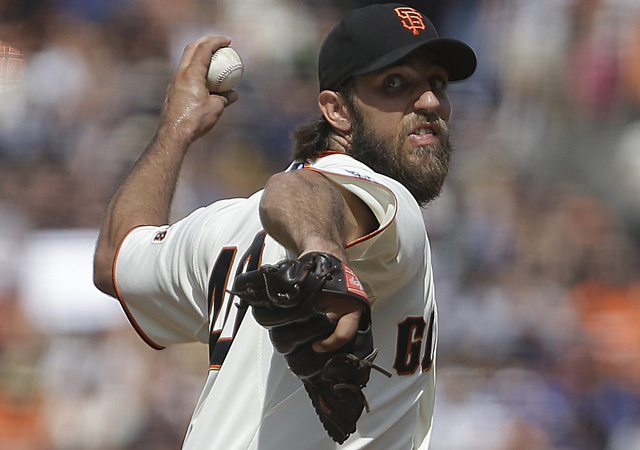 Overall, Bumgarner has pitched to a 2.98 ERA and 121 ERA+ 163 2/3 innings. His three complete games (including a 12-strikeout five-hitter in his previous start) and 14 wins both lead the NL, and his 9.6 strikeouts per nine, 1.5 walks per nine and 6.5 strikeout-to-walk ratio all rank among the league's top 10; his 2.86 FIP is seventh. On the hitting side, he’s batting .245/.273/.491 for a 111 OPS+. His season total of four homers matches last year's total as the highest by a pitcher since 2006, when the Cubs' Carlos Zambrano hit six; subsequently, Zambrano hit four in a season twice ('08 and '09), and the Diamondbacks' Micah Owings ('07) and Brewers’ Yovani Gallardo ('10) did so as well. Bumgarner's 10 career homers are tied with Livan Hernandez for the fourth-most by a pitcher in the post-1992 expansion era; Zambrano has 24, Mike Hampton has 16, and Gallardo has 12. Via Bumgarner’s double-duty heroics, the Giants (64–53) remained 2 1/2 games behind the Dodgers in the NL West and 3 1/2 back in the NL Wild Card race. Their weekend sweep also knocked the Nationals below .500 for the first time since May 6; Washington has lost 13 of its last 17 to fall to 58–59. As a 27-year-old rookie, Matt Shoemaker played a big part in the Angels winning the AL West last year. In 20 starts and seven relief appearances totaling 136 innings, he posted a 3.04 ERA and 3.26 FIP, a performance that helped him place second in the AL Rookie of the Year voting behind Jose Abreu. He was particularly strong in the second half, with a stingy 1.87 ERA and 62-to-9 strikeout-to-walk ratio that help offset the season-ending injuries of Tyler Skaggs and Garrett Richards. Alas, the follow-up to Shoemaker's storybook season hasn't gone so well. After being rocked for 13 runs and four homers in 7 1/3 innings over his last two starts, he was demoted to Triple A Salt Lake City on Sunday. Despite a six-start stretch from June 26 to Aug. 4 over which he yielded a 1.49 ERA, he's at 4.76 right now, due mainly to an exorbitant 1.6 homers per nine. His slugging percentage allowed has shot up from .381 last year to .467 this year. With rosters due to expand on Sept. 1, Shoemaker isn't likely to be in the minors for very long, but his demotion comes at a point when the Angels (60–57) look particularly vulnerable. They've lost 17 out of their last 23 games, turning a two-game lead over the Astros in the AL West to a 3 1/2-game deficit there and a half-game deficit in the wild-card standings, with the resilient Rangers (59–57) just a half-game behind them in both races. Via the Baseball Prospectus Playoff Odds, their chances at reaching the postseason have gone from 89% to 38% in that span, during which they have the league's worst record. What's more, the Halos' rotation has taken a significant hit with the loss of C.J. Wilson, who has elected to undergo season-ending surgery to remove eight bone spurs in his elbow. Wilson's final numbers (3.89 ERA, 95 ERA+) are modest, but he had posted a 3.06 ERA over his previous eight turns before getting roughed up for six runs in four innings in his final start on July 28. With the return of Jered Weaver from a seven-week absence due to inflammation in his left hip, they're down only one regular starter, and both Hector Santiago (2.86 ERA, 129 ERA+) and rookie Andrew Heaney (2.53 ERA, 147 ERA+ in nine starts) have helped pick up the slack. But Los Angeles just doesn't have much margin for error, particularly given an offense that has scored just 3.35 runs per game on .222/.281/.346 hitting during that 23-game slide.